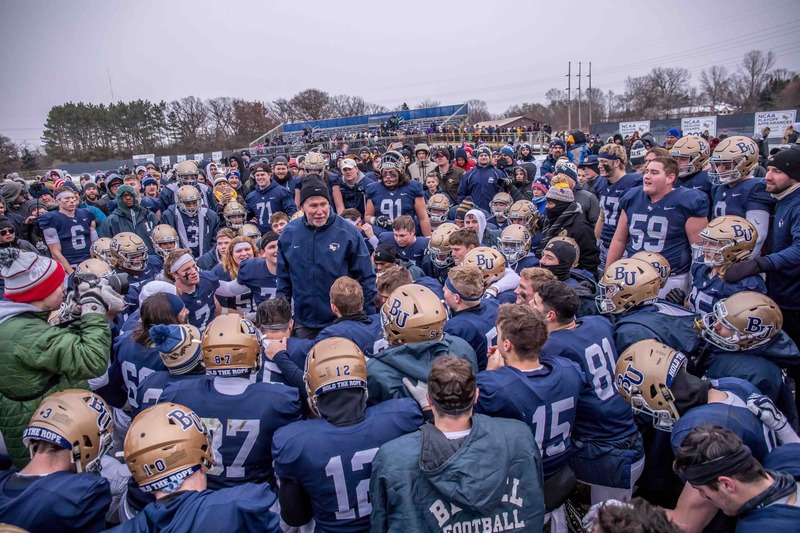 Head Football Coach Steve Johnson ’79 celebrated 30 years at Bethel this year, and he shares his heart for coaching young men on and off the field. 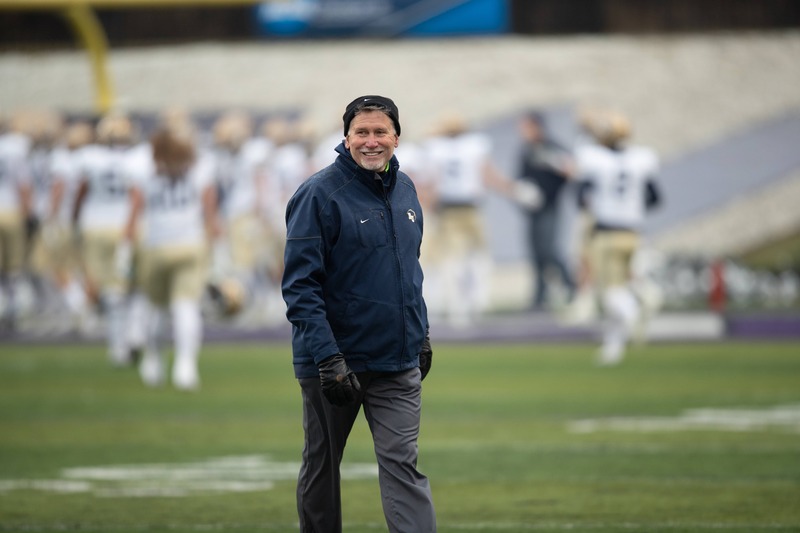 January 15, 2019 | 3 p.m.
Head Football Coach Steve Johnson ’79 has a reputation on campus for wearing his heart on his sleeve. “Coach J” is a tough guy—running players hard and calling them out when needed—but he gets choked up when he talks about “his guys” and his role as their coach. He has an impressive record of 25 consecutive winning seasons and counting, but Johnson’s focus goes far beyond anything that happens on the field. 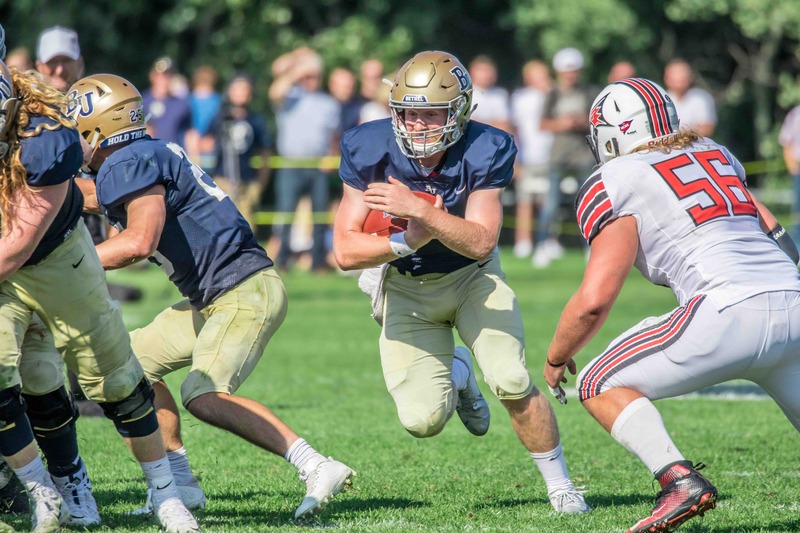 He followed in the footsteps of his dad, who was a Baptist pastor in Chicago, and though he doesn’t preach from a pulpit, Johnson sees every practice and every play as an opportunity to form Bethel football players into high-quality Christ-followers, husbands, and dads who have each other’s backs long after graduation. Here’s what he had to say about it. What brought you to Bethel, and what’s kept you here for 30-plus years? When I graduated from Bethel, I never thought I would return in any capacity. Historically, Bethel football—to be nice—had not experienced much success on the field. It just wasn’t a priority years ago. In 1989, I had some different coaching opportunities presented to me, and I placed Bethel very low on the list. But after some incredible circumstances, and a lot of God’s leading, I felt called to return. The first year we went 3-6-1, but from day one, our aim was to build a good foundation. My vision for us was—and still is—to build up a bunch of tough guys with happy hearts, who love the Lord, love football, and love each other. Then winning takes care of itself. Every season is different. Each one is rewarding and full of trauma in its own way. We’re just trying to be grateful, tough, and devoted, which are daily choices each of us can make. Our guys know I’m going to pound ’em if those become just words. Sometimes it’s easy and sometimes it’s a hard choice to be grateful, tough, and devoted. But I think of Romans 12:9-11, where it talks about living like brothers, honoring each other, and serving the Lord together. Football is hard, but it’s just like life, where you’ve gotta run toward the fight even—especially—when things are hard. That’s where all the best stuff happens. Moms and dads sometimes come up to me after a game to thank me for the impact I’ve had on their guys. I just turn right around and say, “No, thank you!” It’s a team effort to pour into young men, and what I get to do is a tremendous privilege. Do you have any favorite memories that stand out from your time here? There are too many, and I get afraid I’m going to hurt someone’s feelings if I forget one! But 1999, the first time we beat St. John’s. The Final Four in 2007 and 2010. The Elite Eight in 2013 and 2018. Those are really cool deals, and that’s all great. But winning happens as a result of doing other things well; it’s just the fruit of our labor. My best memories are the players and coaches who have built into me and woven good stuff into who I am as a person. What are some life lessons or wisdom that you try to pass on to your guys? Be grateful, tough, devoted. Run to the fight, stay in the fight, finish. Be faithful to what matters, and that means you’ve gotta know what really matters. Present yourself as a living sacrifice, holy and set apart, not only to God but also your team. There’s a lot of respect that comes with success on the field, and we haven’t had a losing season since 1993. But my guys know unequivocally what I’m about. I think there are some coaches in our conference who are jealous of our niche because we sometimes have these amazing players who could go anywhere, and they choose to come play here because of our faith. One of our goals is championships—duh—and we want other teams to hate playing us because we play so hard for so long, because we’re physical and all-out, all the time. But our bigger goal is to be great people who follow Christ with everything we’ve got. That’s who we are, and we don’t have to sugar-coat that. What would you tell parents about Bethel? Your child is in incredible soil. Soil is dirt, so it might not always look clean, but you can bank on it being rich because of our base in our Lord. And the Bethel experience is so much more than you could ask or think. Bethel’s an investment, but it’s worth every penny and more. Academics and athletics aside, if your kid is in the right place, and he’s jumping in and doing the hard work, whatever it costs is worth it. God will make a way for the finances to work out. 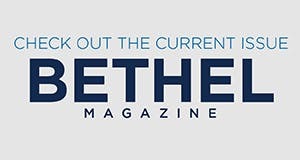 Anyone can go to a less expensive school that doesn’t have good, life-giving stuff—but you can’t put a price on the “above and beyond” that students get at Bethel. What should parents know about this generation of students? I have three millennials of my own. I can’t SnapFace—or whatever it’s called—and sometimes I think we’re on different planets. But I’m incredibly hopeful about this generation. Boundaries are kind of gone in our culture, but this group of young people is coming back a little bit and realizing that’s not okay. Young people want to be pushed, they want to be part of something bigger, and they want to be loved. Some people—parents, coaches—think that just loving ’em is enough, but it’s not. If they want to be their best, they’ve gotta go through some hard stuff. Do you know you’re in a spiritual war? There are weeds that gotta be pulled. I wish I could have knowledge without reading a book. I wish I could be fit without exercising. But it doesn’t work that way! Spiritual health takes discipline, and we better get into it. These young people want to get into it, and they inspire me every day. Football is like life on steroids. Everything we talk about has meaning on the field, but the lessons apply way beyond that. The best thing my staff and I can do is live our lives out, and do it well, in front of our guys. Even the hard stuff that I’ve been through? It’s all grown me. When Jesus died, He asked His Dad if He could get out of it. And that didn’t happen, but He took that cup. He died so we could run! He died so we could stay in the fight! On tough days, when it’s hard for me to stay in the fight, I remember I have thousands of guys out there praying for me—living out their lives like I taught ’em—and it’s just so good. That blesses me. Get a sense for Coach Johnson’s role by listening to his conversation with Mike Max on WCCO 830 earlier this fall. (His interview begins at 16:00). Or see the Bethel Royals in action; view the full schedule of upcoming athletic events at athletics.bethel.edu.